Description The innovative incense burner of Postclassic Colima is composed of back-to-back figures, their heads merging to form the container for burning coals and incense. The handle also serves as the figures' imaginative headdresses, its tall arch providing support for an undulating serpent attached at the front. Similar saurian forms are found today on the headdresses and masks of ritual performers in Colima and Guerrero. 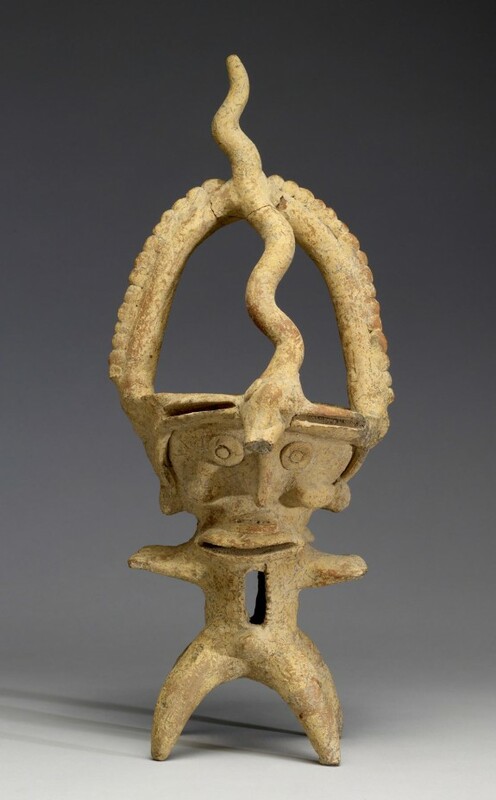 The conjoined figures' outstretched arms and wide stance are strikingly similar to those of the Veracruz ritual dancers (see 2009.20.47), which prompts a similar identification for this unusual type of anthropomorphic incense burner.